As a highly intelligent machine boasting compact and aesthetic structure, easy operation and durable service life, ZB100J paper bag handle pasting machine rids you of manual work and will bring substantial development and generous profits to your enterprise through machine operation. As a highly intelligent and compact device, ZB100J paper bag handle pasting machine adopts a four-axis servo motor and combines onto it technologies from lighting, mechanics, electrics, pneumatics, motion control and etc. 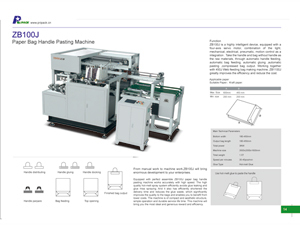 This paper bag handle pasting machine processes automatically handle and bags without handle in the following procedures: handle feeding, bag feeding, gluing, pasting, compressing, and finished bag outputting. When operated with 450J web feeding bag making machine together, its efficiency can be substantially improved, greatly lowering your costs. Only kraft paper is applicable on this pasting machine. Sheet Offset Printing MachineThe MP-450 sheet offset printing machine (double color offset printer) is widely used in iron-plate or PS plate printing. It can be connected to achieve single color, double colors and multi-color printing, and also can connect to coating and varnishing machine.